Without the aid of an episode guide I’m struggling to remember what filled twenty odd episodes of the Mentalist. The cases are about as disposable as procedurals get these days, yet there is also very little interesting going on with the characters, leaving me pretty unsatisfied with my 18ish hours of viewing. 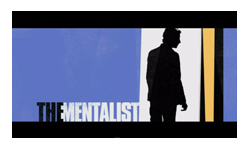 The eponymous Mentalist, was an intriguing enough character to carry the first season, but apparently not enough to carry the second. His little tricks, misdirections and manipulations are now all a bit old and far too predictable. The character should be one of the most complex on television. Jayne is constantly putting on a performance to cover the fact that he’s consumed with guilt about taunting a serial killer, Red John, who then went on to murder Jayne’s wife and child. He is supposedly working as a consultant on investigations only to get access to information about Red John so he can take his revenge. But the writing is not up to dealing with such a character, or maybe that’s just not the kind of character that can be a star of a primetime drama. Because 95% of the time the care-free performance is so good, there’s not even the slightest hint of everything else. The other 5% of the time it feels too much as if the writers are suddenly remembering there was something they were supposed to do and throw something together in heavy handed fashion. If they’d gone for the purely light-hearted approach I think the show would be better (although even more obviously related to rival show Psych than it already seems). Jayne’s playful approach to the puzzle solving side of investigations is a lot of fun, and the collection of sidekicks support it nicely. Each character reacts to Jayne’s antics differently and with a good mix of humour, acceptance, eye rolling and awe. Cho’s deadpan humour and complete unflappability are particularly entertaining. Even the office romance between Rigsby and Van Pelt was handled in a surprisingly satisfying way. Likewise if they’d gone for a more dark approach it would have been interesting. How much of Jayne’s apparent callousness towards victims and families is self-hatred? How can someone possibly be considered stable enough to work on cases when he sleeps under the smiling face his family’s murderer drew using their own blood? How can his partner keep allowing him to investigate that case when he’s repeatedly declared that when he finds Red John he will kill him? It’s heading into Criminal Minds territory with the thoughtful approach to psychology and the consideration of the long term effects violence has on people’s lives. I guess the writers were aiming for contrast, but what they ended up with was contradiction. With my ever increasingly packed television schedule, I don’t think I’ll be returning to The Mentalist next season unless I hear it’s found a happier balance.